On February 1, 2019, UN Women held a multi-stakeholder forum to address the priority theme of the sixty-third session of the Commission on the Status of Women, “Social protection systems, access to public services, and sustainable infrastructure for gender equality and the empowerment of women and girls”. The concept note and discussion guide for the forum can be downloaded here, and the full program here. Melissa Upreti, Senior Director of Programs and Global Advocacy at the Center for Women’s Global Leadership, spoke on the second panel under the theme “Public services for gender equality and the empowerment of women.” She highlighted the gains women’s rights advocates have made over the years as well as the major challenges that they are currently facing, and urged the recognition of social protection issues firmly as women’s human rights issues. Her remarks are reproduced below. All the panelist’s remarks can be found at the UN Women site for CSW 63 preparations. Good afternoon, your excellencies, my fellow panelists and everyone gathered here today. First of all, I’d like to thank UN Women and the Commission on the Status of Women for inviting me to join this important discussion. Before commenting on public services, I’d like to take a few minutes to reflect on women’s human rights and the current political climate. 2018 marked the 25th anniversary of the Vienna World Conference on Human Rights where women’s rights were for the first time clearly recognized as human rights; some remember it as the moment when women were finally recognized as “human” under international law. This period was also marked by the launch of the 16 Days of Activism on Violence Against Women Campaign, with the support of the Center for Women’s Global Leadership, which helped secure the recognition of violence against women as a human rights violation. The main objective of these demands was to bring women under the protection of international law. This year, marks the 25th anniversary of the adoption of the ICPD Platform of Action, which reinforced the recognition of women’s reproductive rights as human rights and next year we will celebrate the 25th anniversary of the adoption of the Beijing Platform for Action. These policy documents have been utilized extensively by governments to develop national policies on women’s reproductive health and education as well as laws prohibiting violence against women and for gender equality. As noted in the SG’s report, there has been some progress in increasing women’s access to public services, specifically health and education. However, not to be alarmist but in the spirit of being realistic, we cannot ignore the current political, economic, social, and cultural climate that we are living in, as we think about the future: one that is characterized by backlash and persistent attacks on gender equality, where the concept of gender is being challenged by opponents of women’s rights and misleadingly characterized as an “ideology” that is opposed to family values; troubling populist rhetoric grounded in racism and misogyny which is helping amplify those voices and drown out the voices of women; the shrinking space for civil society and reprisals against women human rights defenders; the displacement of millions of women across the world due to climate change, war and organized crime in local communities; impunity for acts of discrimination and violence perpetrated by individuals, corporations, as well as governments; and the duality of efforts by some governments to promote peace and security while enabling war to sustain their economies. In the field of education, as noted in the SG’s report, while access has improved for some, getting a quality education that is affordable and being able to continue an education is still a challenge with girls being expelled from school for being pregnant or pulled out for marriage. Adequate safeguards against violence are also lacking. There are countries where the number of women graduating from higher institutions of learning exceeds that of men. But their ability to work and professional advancement is hampered by disruptions to their careers associated with childbearing and unpaid care responsibilities. This is a significant problem because: first, it excludes many capable women from the workforce, which also effects their economic security; and, second, it is a barrier to gender parity. Exclusion from education continues to contribute to the horizontal segregation of women in employment sectors that pay less and have less favorable conditions of work and social protection; combined with the limited participation of women in trade unions and a race to the bottom by some governments to offer women’s labor at the cheapest possible rate, the situation of many women across the world remains extremely precarious. In the field of health care, while there have been some improvements, disparities in access persist in every country and oftentimes these are a result of policies motivated by demographic and political concerns. Such measures will make it impossible to fulfil the commitment to “leave no one behind,” by contributing to a larger pool of vulnerable populations and creating new categories of vulnerable populations. The failure to ensure universal access to health services, including by excluding certain reproductive health services from health systems and, even worse, legally prohibiting or criminalizing them is outrightly discriminatory. The SG’s report acknowledges the issue of stigma in health care, but stigma in health care, and the violence associated with it, cannot be addressed without talking about the need for decriminalization. Further, access to women’s and girls’ reproductive health services is increasingly being hindered by conscience-based refusals that clearly violate human rights and constitute an abuse of power – these types of issues must be acknowledged and addressed to ensure the accessibility and quality of women’s health care. The challenges faced by many developing countries are even more serious. For example, according to the WHO, contrary to some perceptions that refugees rush to wealthy countries, 85% of refugees globally are hosted in developing countries. As such, looking ahead, the strain on public services in a number of developing countries and risk of exclusion of certain populations is likely to increase. In order to tackle discrimination in the provision of services, there needs to be a more rigorous assessment – and not merely an acknowledgment – of how certain laws, policies and programs embody discriminatory gender stereotypes and perpetuate women’s systemic disadvantage, thereby contributing to violence against women in different spheres. These must be replaced with ones that are more directly anchored in human rights standards of substantive equality. The obligation to eliminate discrimination is immediate under international law but, unfortunately, this urgency is not reflected in the actions of all governments. 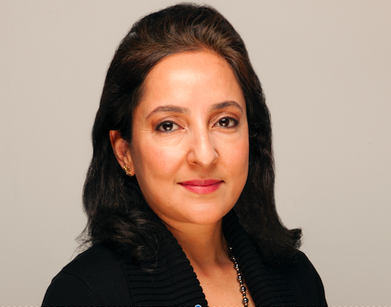 In many instances, ending discrimination will require paradigm shifts in legal and economic frameworks and in how we understand women’s roles in different spheres as well as what constitutes crisis, which cannot be understood merely in terms of the absence of war but as existing in the many threats and insecurities to women’s well-being that are linked to social, cultural and economic inequalities – many of which are embedded in our systems. What we’d like to see as a concrete result for CSW63 is a higher level of understanding and recognition of the issues of social protection, public services and investment in infrastructure, as women’s human rights issues, and – the discriminatory aspects of these issues in policy and practice framed and addressed with a strong focus on accountability and an approach that is anchored more directly in the recommendations of human rights treaty bodies and special procedures, including the UNWGDAW, whose series of thematic reports provide a strong basis for framing many of the issues that will be raised at CSW63 as issues of discrimination and whose recommendations provide clear action points. Linked to this, we would like to see a stronger focus on promising practices, rather than just a re-affirmation of the problems that exist and to have a conversation that is action-oriented. And when I say promising practices, I do not mean, for example, laws and policies that are strong solely on content, but ones that have been developed through the broad participation of affected groups and are being implemented in a way that unquestionably empowers women. As noted by the leadership of the Feminist Alliance for Rights, of which the Center is the secretariat, an approach that does not regard disadvantaged women merely as vulnerable groups but as individuals with agency and leadership potential who know what they want and need must also be reflected in the outcomes. As we do this we must take into account the reprisals against women human rights defenders who are being punished for speaking out against powerful political and economic interests. We need to see stronger condemnation of the crimes being committed against WHRDs and the creation of new safeguards to protect them. 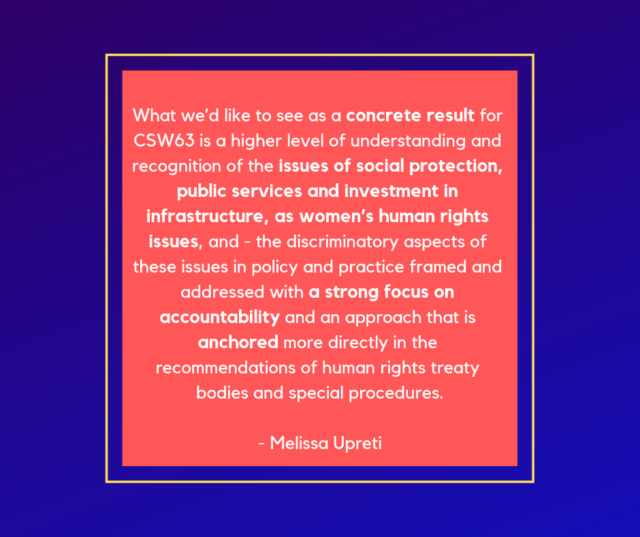 All of these outcomes must reflect clearly in the discussions, conclusions and actions that follow CSW63. We will offer the use of our 16 Days digital platform for discussion and expert commentary on a range of topics examined during CSW63, with a focus on whether a human rights-based approach is being taken and accountability mechanisms are being fully utilized. We will co-sponsor a panel on March 13 inside the UN, with the UNWGDAW, which will provide an opportunity to make some of the critical links between social protection, public services and investments in infrastructure to systemic discrimination against women and, based on the thematic reports and official country visits of the WG, highlight promising practices and discuss the steps and new approaches that are needed to address these issues. We will co-sponsor a second panel on March 19, inside the UN with the UNFPA-Syria Hub, to discuss social protection in the context of crisis and the need for a fresh approach to how we understand crisis, and you are indeed welcome to join us for both.